Harka Bahadur Chhetri today launched his political outfit, the Jan Andolan Party (JAP), whose manifesto said it would work towards "the eventual attainment of a separate state" but would also focus on other issues concerning the Darjeeling hills. 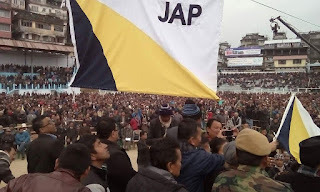 The 23-point manifesto and the flag of the new party were released at a public meeting at the Mela Ground in Kalimpong to cheers by about 10,000 people. Chhetri said nothing about his party contesting the coming Assembly elections. After the public meeting, Chhetri was asked if his party would contest the state elections. He said he had just launched the party and the matter would be discussed later. The first point of the Jan Andolan manifesto said: "The party shall... work towards the goal of autonomy and self-governance by the eventual attainment of a separate state of this region based on the principle of inclusiveness, territorial contiguity, cultural harmony and economic and political rationality, all the time bearing in mind the twin concerns of national integrity and security." The Kalimpong MLA, who is the president of the new party, said: "The separate state (demand) finds mention at the very top of our party manifesto, but that is not the only issue. We have many others issues that we have enunciated in our manifesto, and we will work towards achieving them step by step," he said. and strive to secure a fair and just land administration that will grant rayaitti patta rights to plantation, village and urban dwellers, among others. members and Nayan Pradhan, who was named the secretary. "We are in favour of collective leadership. Our workload will also be distributed accordingly. We are new. We have only five or six members in our national bureau for now. With time and future programmes, there will be an increase (in the number of office-bearers)," said Chhetri. The party also released "Vision Statement, 2025". The statement has seven core political, economic, governance, knowledge society, socio-cultural and environment-ecology visions. "Our mission statement has detailed the tasks that we aim to achieve by 2025," said Lama, who explained the vision statement to the public. The vision statement states, "plans to nurture and build confidence in all communities living in this region. It will strive to bring newer opportunities and enlarge development horizons. It will connect the region and its people with the, regional, national and global world. It will triumph by attaining the seemingly insurmountable goal of a separate state. As the time horizon is short, speed, solidarity and clear thinking are the need of the hour." In Darjeeling, Morcha president Bimal Gurung said he welcomed the formation of the new party, but added that "any party in the hills cannot ignore the main demand of the Gorkhas, which is Gorkhaland". A party must always work in the interest of the people," he said on the sidelines of an event where about 140 members of the GNLF and Trinamul Congress from Teesta Valley and Takdah joined the Morcha.